After the ceremony at the top of the mountain, we drove down a very steep and rocky dirt road to the location along the Kagera River where water is typically collected by the surrounding communities. As we approached the river, we had a spectacular view of the mountains in the background. 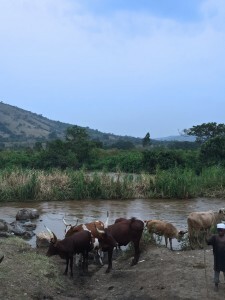 Our driver, William, explained to us that the river is the border between Uganda and Tanzania, so those beautiful mountains just past the river belong to the beautiful country of Tanzania. 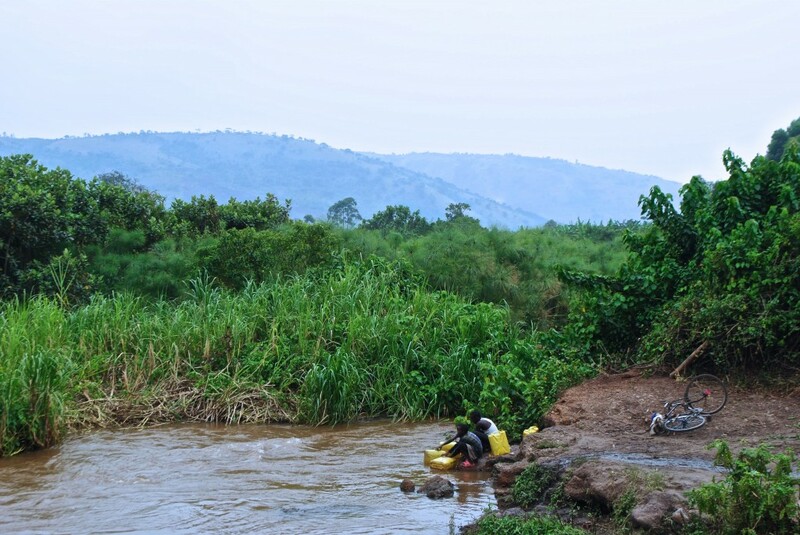 When we arrived at the water source, two children were at the bottom of the hill collecting water in jerry cans to be loaded on their bike and brought back home to their family. Following a short break to enjoy the scenery and take photos, we began our sampling and testing of the water. 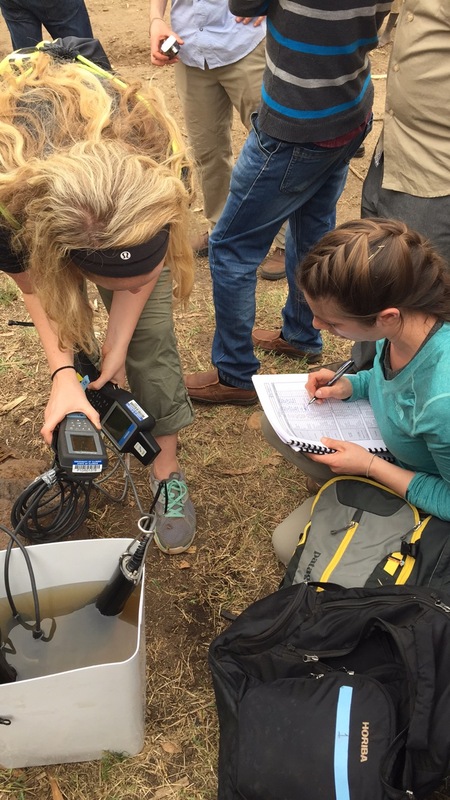 While Madeline, Hannah, Stephen and I were testing the water for a number of water quality parameters with the YSI and Horiba probes, Lauren was teaching Abdullah Dhiblawe about how to use the turbidimeter and what exactly it tests for in the water. After a few minutes of setting up the Horiba probes, I happened to turn around and look at the river. 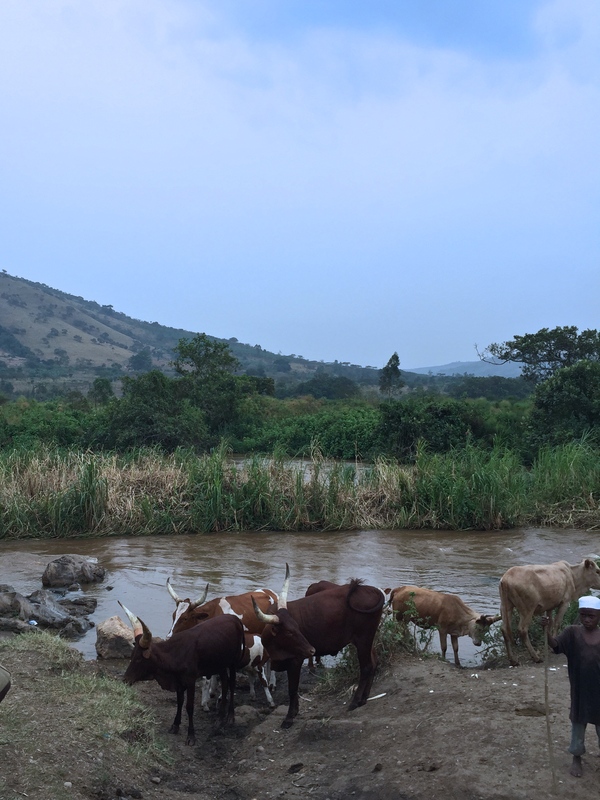 To my great surprise, at some point while we were testing, a herd of five or six cows walked right past us to the riverbank without anyone noticing. Once we had all of our samples from the river, we headed to the Base Camp for lunch, where the Commander welcomed us to the refugee settlement once again. After the extremely warm welcome that we received from the village at the top of the mountain, as well as the welcomes that we have received from everywhere else that we have been so far in Uganda, I was not surprised that we were, yet again, being welcomed so graciously to the settlement. 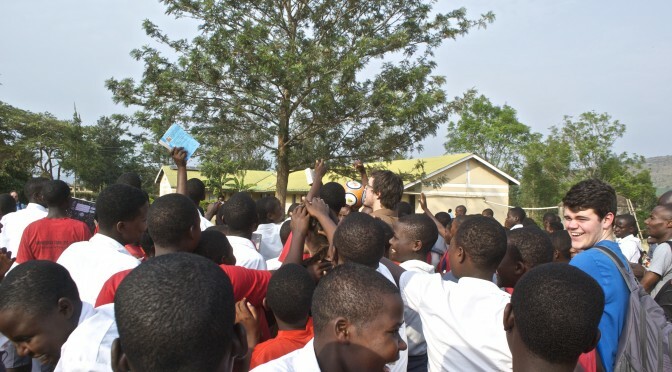 We finished eating and all headed across the street to the secondary school to teach them about health and sanitation through various games and activities. I was surprised by how many students there were at the school. In the classroom, Lauren led activities that showed the school kids how easily bacteria can spread, how you can’t always tell by looking at water that it is contaminated, and the effects that high levels of fluoride in water can have. 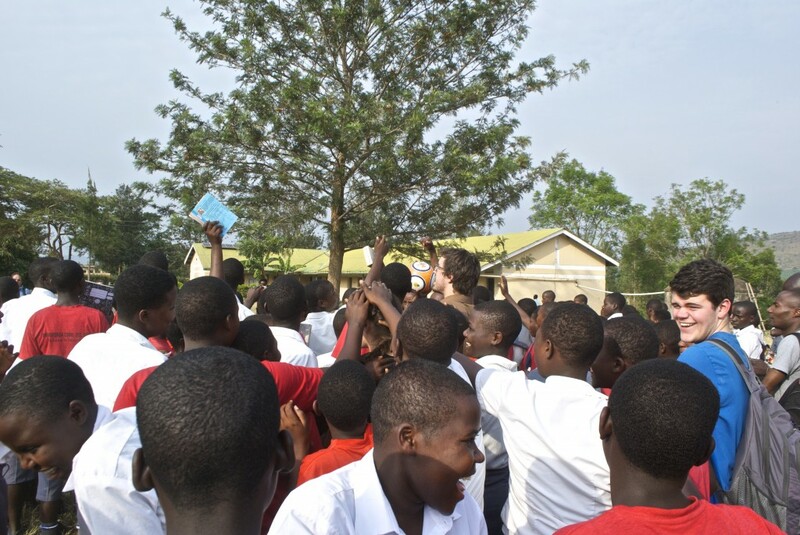 After we finished the activities inside, we went outside with the students to play a game that involved dividing into teams, asking the teams questions, and awarding the first team to answer the question correctly with a chance to score a goal on Daniel with a soccer ball. Many of the students near me didn’t know the answers to the questions, but they seemed to be just as excited to see their classmates (try to) score a goal on Daniel as they would have been if they were to have been able to do it themselves. Bernardo gathered everyone together to take a polaroid photo, after Lauren and Daniel gave the soccer ball to the students. Some of the students must have been very intrigued by Lauren’s braided hair because found it very entertaining to run their fingers down the back of her head. It completely broke my heart when I was speaking to one of the students, Fiona, and she told me that should would love to be able to study at a university in the United States, but that there is no chance that that would ever happen. While I encouraged her that she should never doubt her abilities to accomplish her dreams, it saddened me greatly knowing that typically, it really is very difficult for students in African countries to further their education in the United States. Before we could go back to the hotel, we had to take a few samples and test the water at the secondary school borehole, as well as at the borehole at the basecamp. 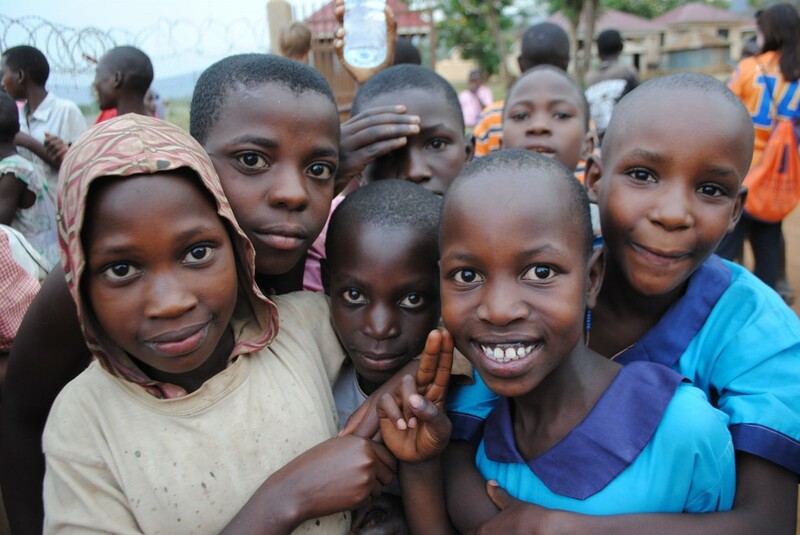 When we got to the borehole at the basecamp, school children were lined up, waiting to fill up their jerry cans to bring home to their families. While we were waiting for the colorimeter tests to finish, we got the chance to talk to the children around the borehole. They all wanted us to take photos of them, but didn’t quite understand that we couldn’t produce a copy of the photo from our digital cameras and phones. As usual, we were sad that we had to leave, but ready to go back to the hotel after a long day of field work.